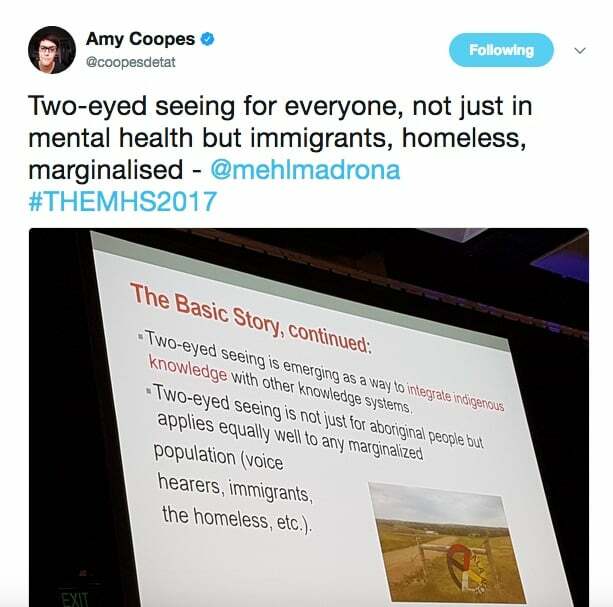 “Two-eyed seeing”, a framework for integrating Indigenous and Western knowledges, was profiled at a major mental health conference in Sydney this week. 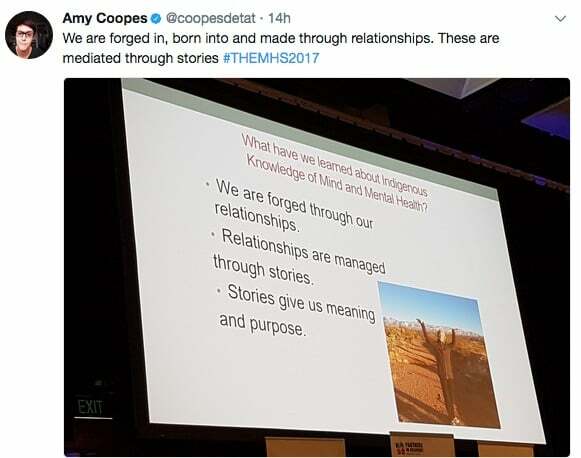 The conference also heard about the importance of relationships and storytelling for healing, reports Amy Coopes for the Croakey Conference News Service. 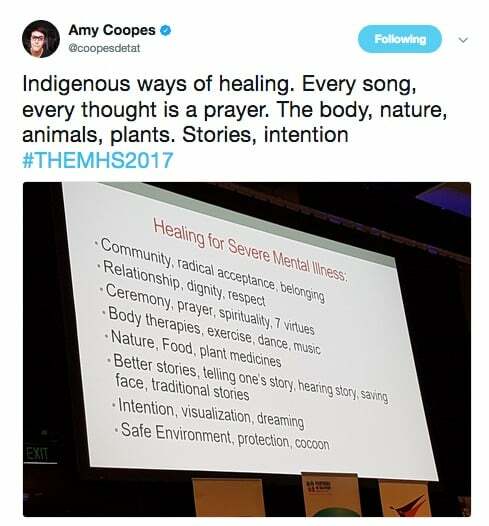 Culture is medicine and healing, and stories are its salve, with Indigenous knowledge more vital than ever to the planet and to health, a major mental health conference was told on Thursday. 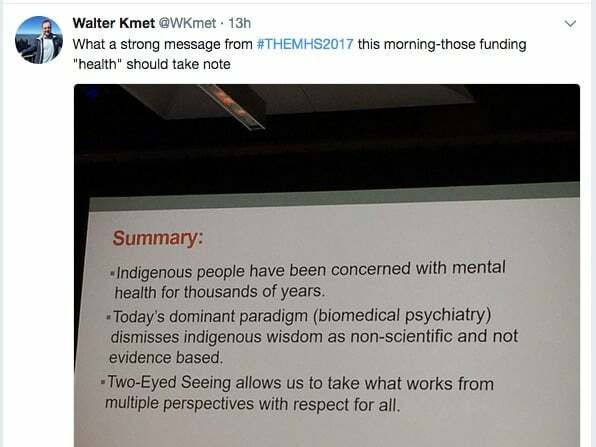 Dr Lewis Mehl-Madrona, a researcher at the intersection of Indigenous healing and the biomedical model, delivered a keynote address at the TheMHS annual forum in Sydney on etuaptmumk, a word from the M’ikmaw Nation in Canada meaning ‘two-eyed seeing’. 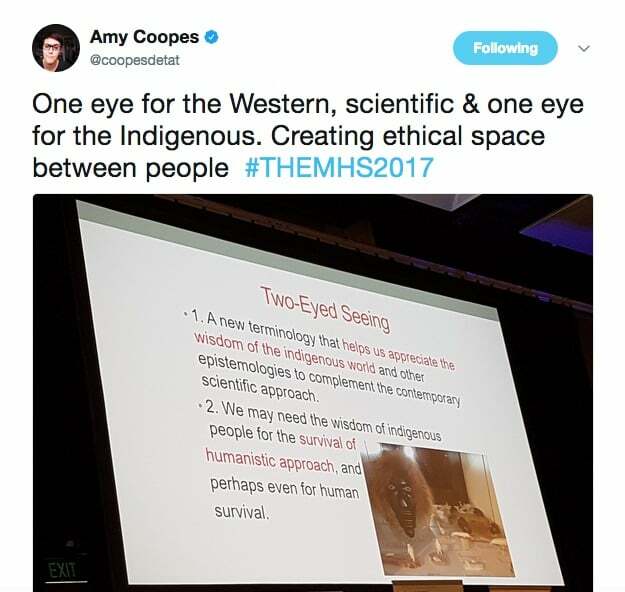 Two-eyed seeing is a framework embracing Indigenous ways of understanding the world and integrating these with Western bodies of knowledge, in an endeavour of collaboration and respect, where a tribal consciousness was cultivated, taking the best from both worlds. Mehl-Madrona, who is of Lakota and Cherokee heritage and started his address with a traditional song of welcome, shared his personal journey with culture, from Stanford to Saskatchewan, working as a “roadie” for Lakota medicine man Melvin Grey Fox in an era where ceremony was illegal. During this time he witnessed powerful experiences of healing, revealing a profound, millennia-old body of Indigenous knowledge about the mind and mental health that centred relationships and stories. In Lakota culture, the closest thing they had to an understanding of the ‘self’ was a concept known as nagi – the “swarm of stories that make us who we are”, each story containing a spark of the being who told it. Mental health was seen as a product of these stories, whether good or bad, and diagnoses or labels were understood not as a noun but a process – for example depression was “performed”, not innate. 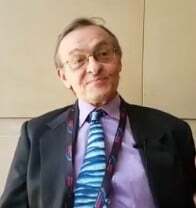 Stories were regarded as “all we have to fight off illness and death” he said, noting that data supported this for Indigenous people. 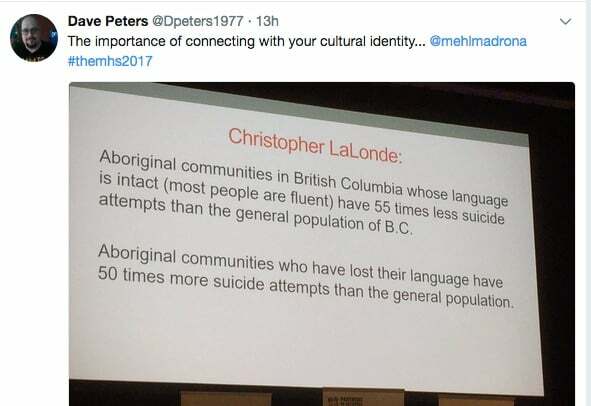 In British Columbia, for example, communities that had lost their language had 50 times more suicide attempts than the general population; where language was intact or fluent, these attempts were 55 times lower than population averages. Stories had the power to change the body, said Mehl-Madrona, relating research showing that people with elevated blood pressure who were told stories about blood pressure being reduced actually went on to realise this physiological effect. “If you want to change the world start talking and keep talking, tell your story,” he said. Stories had more power than statistics because, instead of simply revealing an effect, they allowed an interrogation of the ‘how’. 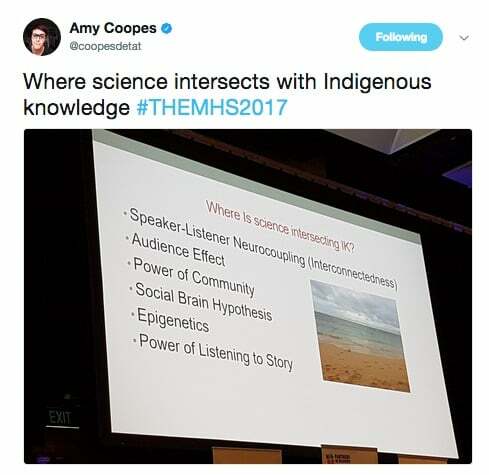 Whether in North America or Australia’s Aboriginal and Torres Strait Islander communities, Indigenous knowledge-making had some striking similarities, said Mehl-Madrona. It was derived from systematic observation of the way things work, and was consensus driven, arrived at through collaboration and deliberation in groups. Mehl-Madrona said Indigenous epistemology was, by necessity, pluralistic and the opposite of positivism and reductionism. “In Australia there are 500 creation stories, they are all true and they are all different,” he said. Each was true for the place of its origin, and for the people who told it. This was especially relevant in mental health, he said, where love or depression couldn’t be explained through neurochemicals alone, or the parts of the brain activated and affected. 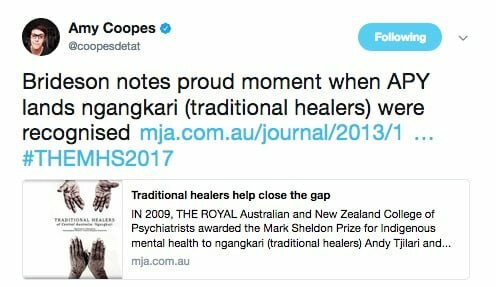 Indigenous cultures captured the collective dimension of health in a way that was lost in individualistic biomedical approaches, even understanding the mind as a plural enterprise where there were conflicts and coalitions. Where there was one world and one people, everybody was responsible for one person being sick, with the social environment shown to change the brain much more dramatically than drugs in studies. Research on mirror neurons and work around the social brain had validated how important this was, he added. In this context, Mehl-Madrona said Indigenous cultures understood that people “get unwell on our behalf” and should be honoured, because if it hadn’t been them, it could have been you. 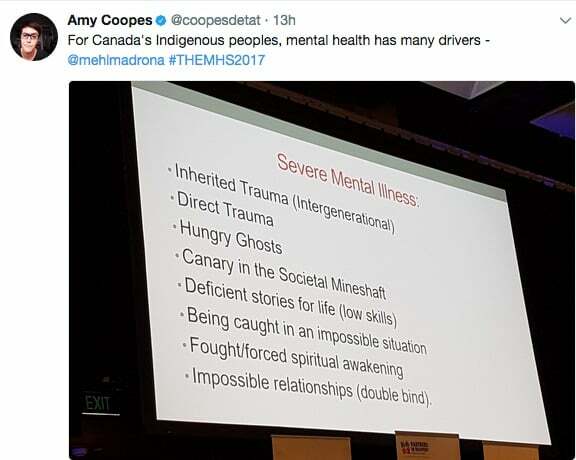 Two-eyed seeing conceptualised mental health for Indigenous people as the product of intergenerational and direct trauma, of bad spirits and stories (maladaptive narratives), impossible situations and relationships, seeing severe mental illness as the “canary in the societal mineshaft”. It also had much to offer in terms of healing, he said. 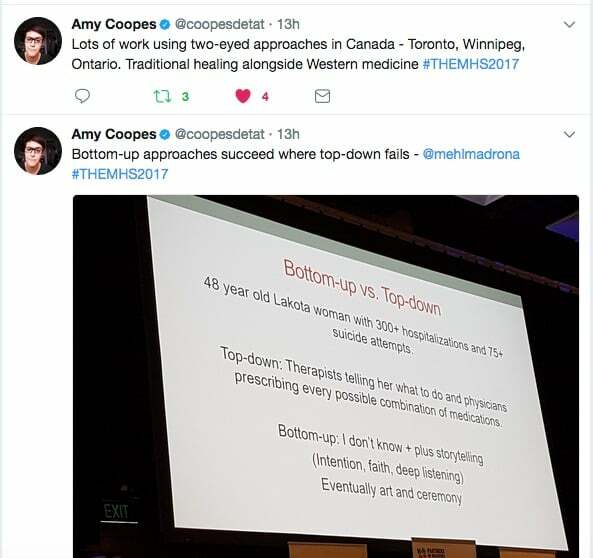 While it was unknown whether conventional approaches to mental health actually worked, Mehl-Madrona said the “invisible system” of Aboriginal mental health did. “We need Indigenous knowledge now more than ever, ecologically and humanistically, to leave the world better for generations after,” he said. 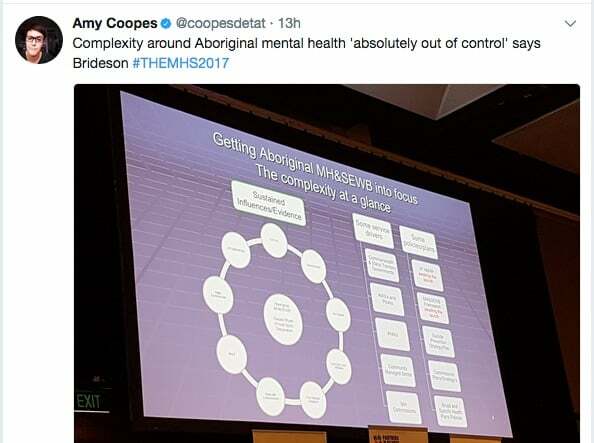 TheMHS chair Tom Brideson – a Kamilaroi and Gomeroi man – said it was time to start advancing the two-eyed seeing framework in Australia, placing Indigenous stories and healing alongside the biomedical model. 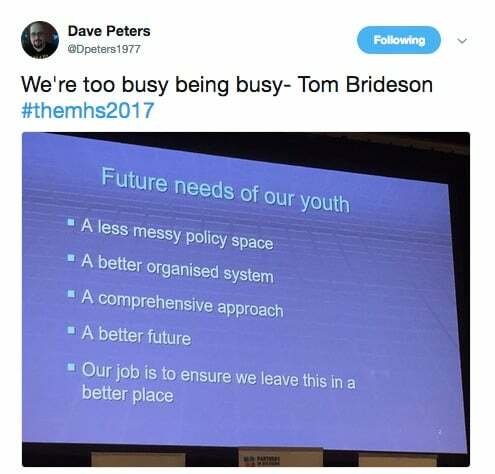 On mental health, in particular, he said the complexity of policy and funding arrangements was “absolutely out of control”. 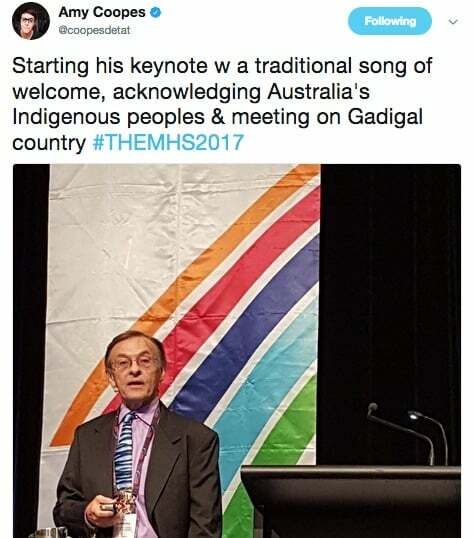 He pointed to the Gayaa Dhuwi (Proud Spirit) declaration on Aboriginal and Torres Strait Islander mental health, and said community would be crucial to advancing this agenda. 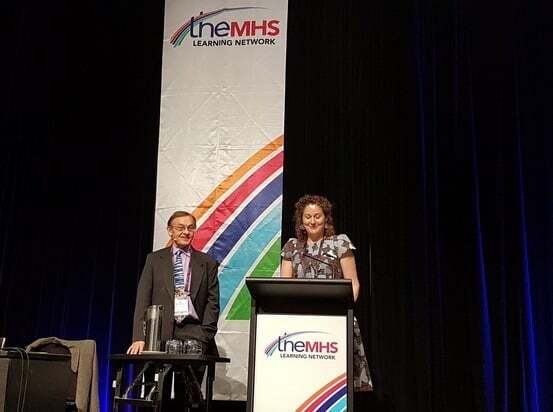 As previewed at Croakey, the conference – Embracing Change Through Innovation and Lived Experience – is bringing together hundreds of workers, consumer-survivors and advocates from the mental health sector, and continues in Sydney this week. 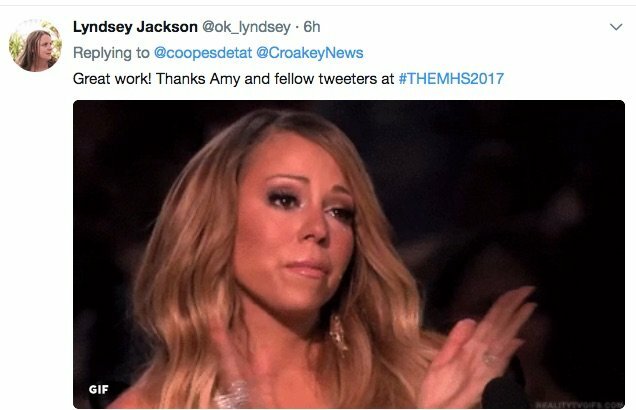 Follow #THEMHS2017, @coopesdetat, @wepublichealth and @themhsorg for the latest news. 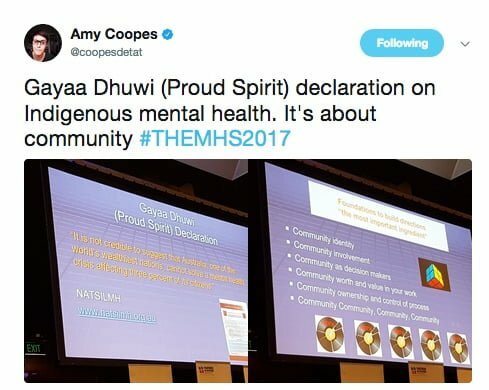 Amy Coopes is covering #TheMHS2017 for the Croakey Conference News Service. I would like to attend another conference like this one, I am sorry that I missed out. I have a story to share of my life and from where I have come from. I believe resilience is that what kept me alive, I have lived experiences that I do not wish others to have. I feel that stories are a way of expression and hope for others, no two stories are the same. We may come from many backgrounds but we all have to end up in the same place. My Grandfather always stood up for his rights, and as family members we also were taught to stand up for our rights for what we believed in. I myself came from a generation where past events such as The Stolen Generation impacted upon my parents lives, to this day it still impacts on the way different family members react today. I myself have had my children taken away from me, just because I did not have a home or a job to support my children. Of course it went in favour for the other party who had a job and was living in a house that my children grew up in. That did not stop me from believing that yes I am somebody and I can do all things that I put my mind to. I came from sleeping in a two man tent on the beach to owning my own car and working in a position that I am passionate about. I am studying my Masters in Health majoring in Mental Health. I hope to travel the world and to share my story, my story of hope and resilience. Thank you all for listening. Mental Health is not only the mental state of thought patterns but the spiritual, physical and being of a human being. All must be treated fairly and just. There is no room for mistakes of the past we must learn to live now in the future. Jacqueline Brown Ghunalou, Mulinjali/Gubbi Gubbi/Bunjalung Woman.